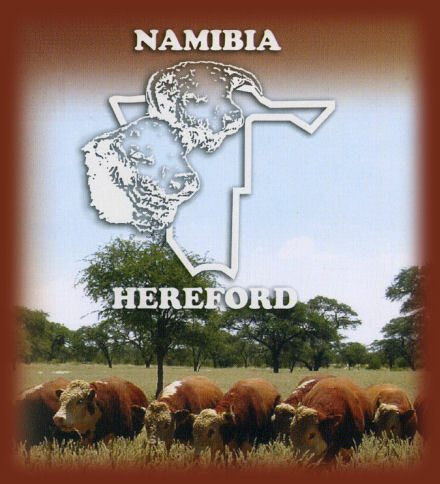 insist on free-range Namibian Hereford"
This is the Namibian Hereford Association´s motto! We are currently working hard at being more aggressive when it comes to talking about the Hereford as Namibia´s most efficient beef-producing animal. We are confident that the future looks very bright indeed, as many more commercial farmers are planning to build up beef-producing herds again. This is reflected in the sudden demand for top quality Hereford bulls. The breed´s unrivalled economy in the conversion of grass to meat and its other chief characteristics, notably easy calving and docility, have ensured renewed interest amongst successful commercial beef producers in this country. The breed is growing in leaps and bounds, as farmers begin to recognise the hardiness, rustling ability, fertility and adaptability of the Hereford. Herefords show less excess fat, higher rates of gain, and higher yielding carcasses that are more profitable. We are improving our breed stocks to such an extent that we are proud not only to show an increase in bull sales, but also to show remarkable increases in average prices obtained for Hereford bulls year on year. Herefords are attracting huge interest because the changing meat industry is searching for a superior performance that only Herefords can offer. We have recognised this golden opportunity largely due to the tremendous improvement in our cattle, and the considerable strides we have made in increasing size and scale. Herefords are much improved structurally with good fleshing and, most importantly, good hind quarters. Hereford crossbreeding is making significant improvement in growth rate, size and red meat yield. And next time you eat steak . . . insist on good Hereford quality!